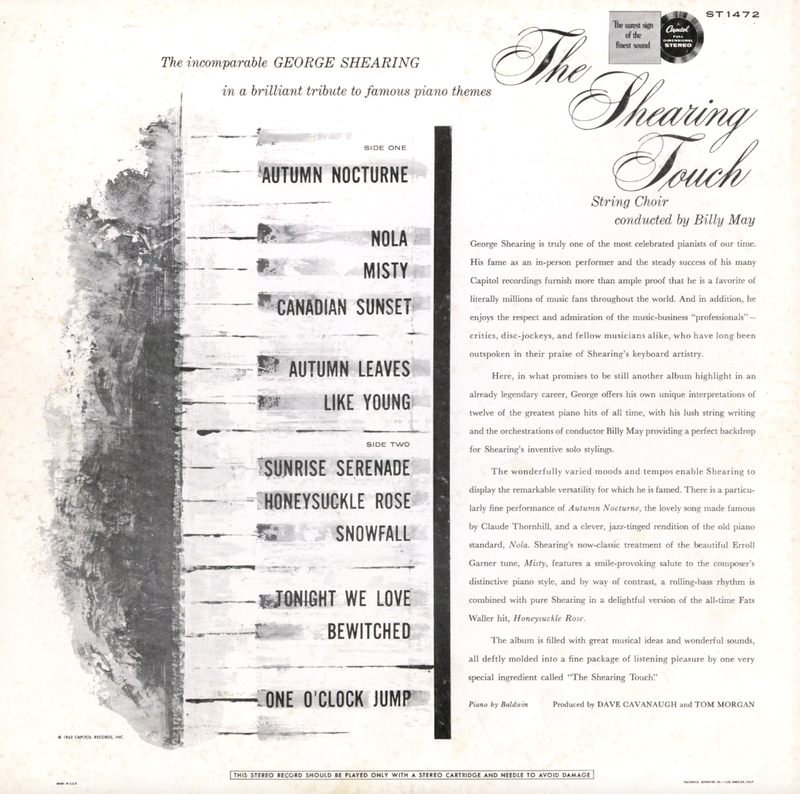 Barney Kessel & Shelly Manne appear by arrangement with Contemporary Records. 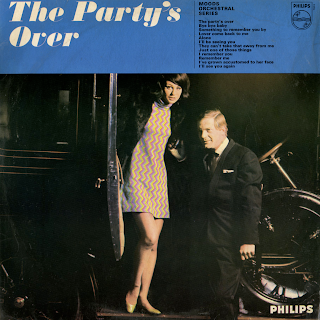 Bud Shank appears by arrangement with Pacific Jazz Records. 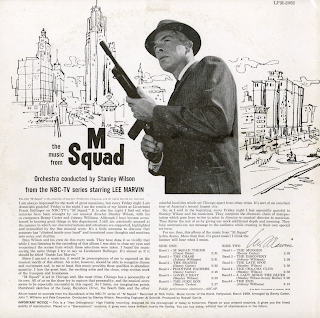 From Billboard - August 18, 1956: Here's an interesting and swinging new disk that features Rogers in a variety of groupings. 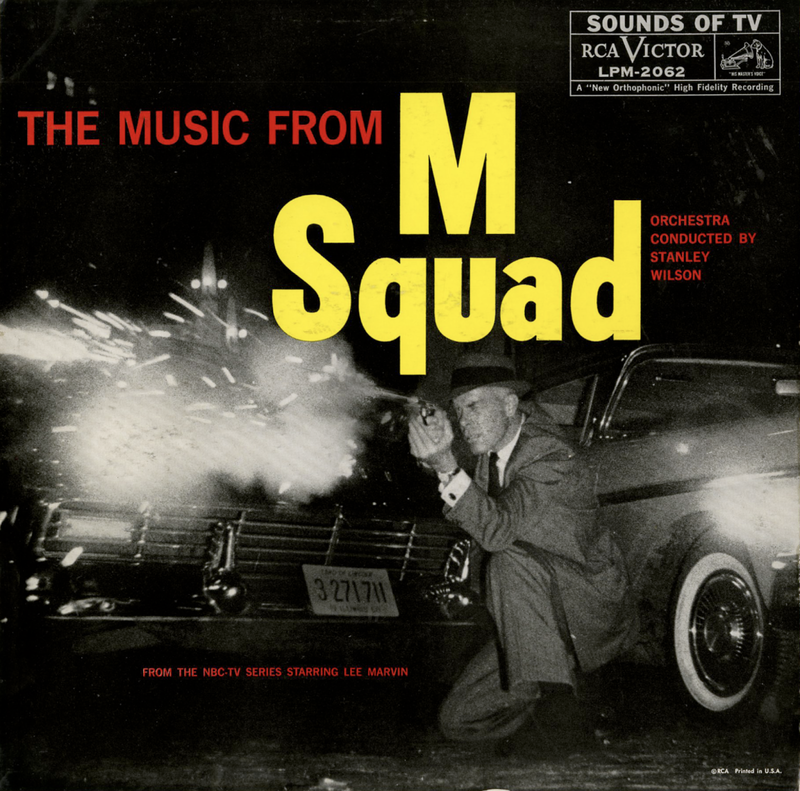 In only one is the entire nine-man "Giants" crew featured, but there is a lot of satisfying listening in the quintet and septet line-ups as well as the group featuring a four-man trumpet ensemble, backed with rhythm. 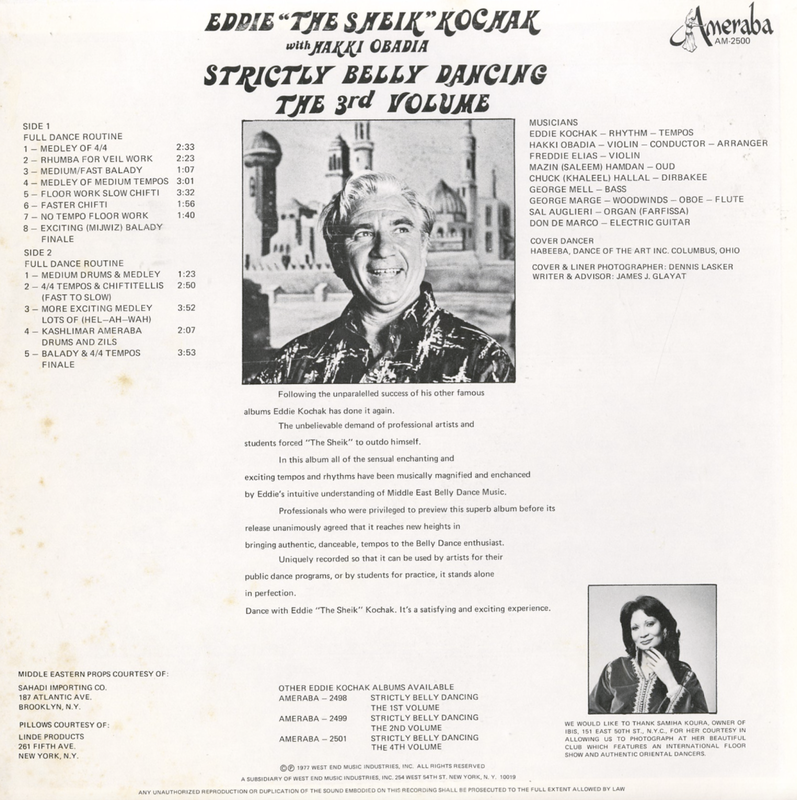 Solid performers include Candolis, Fagerquist, Kessel, Manne, Edison, Vinegar, Pena and, of course, Rogers himself on trumpet and flugelhorn. 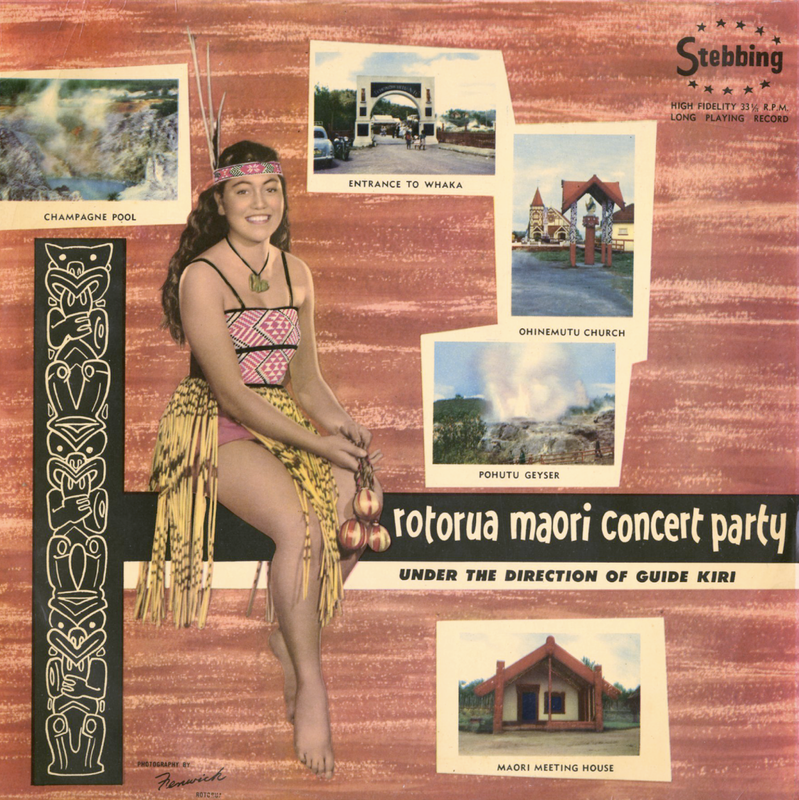 A highly commercial jazz package with an imaginative cover worth plenty of display. 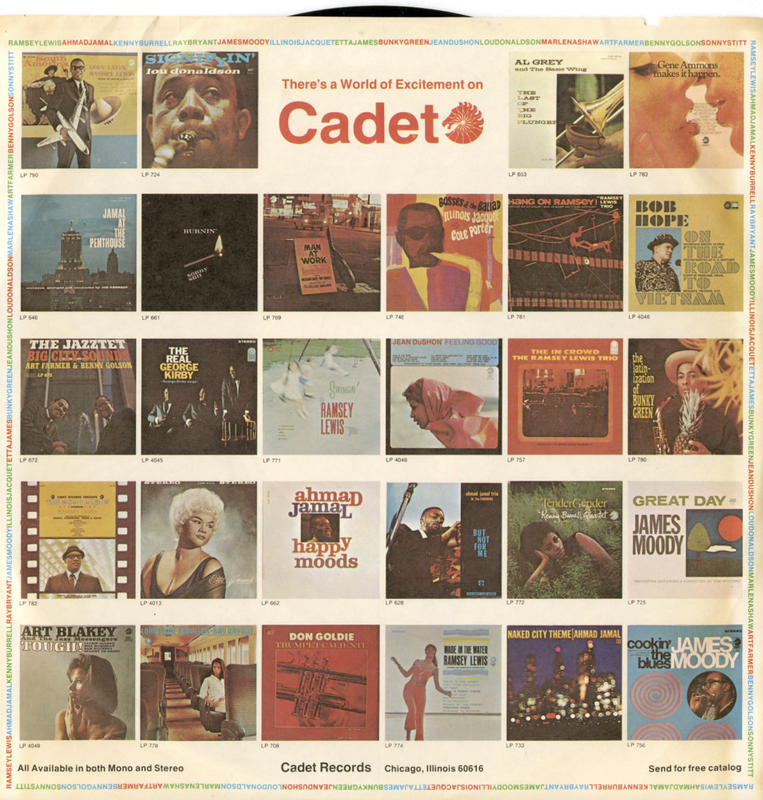 Performed On The Largest Hammond Organ Combination In The U.S.
At age 17 enlisted in U.S. Naval Mine Force, Pacific area. Following his separation he returned to study music. Attended N.Y. College of Music, Harnett School of Jazz, took private instruction, studied harmony, theory, composition, arranging, orchestration. 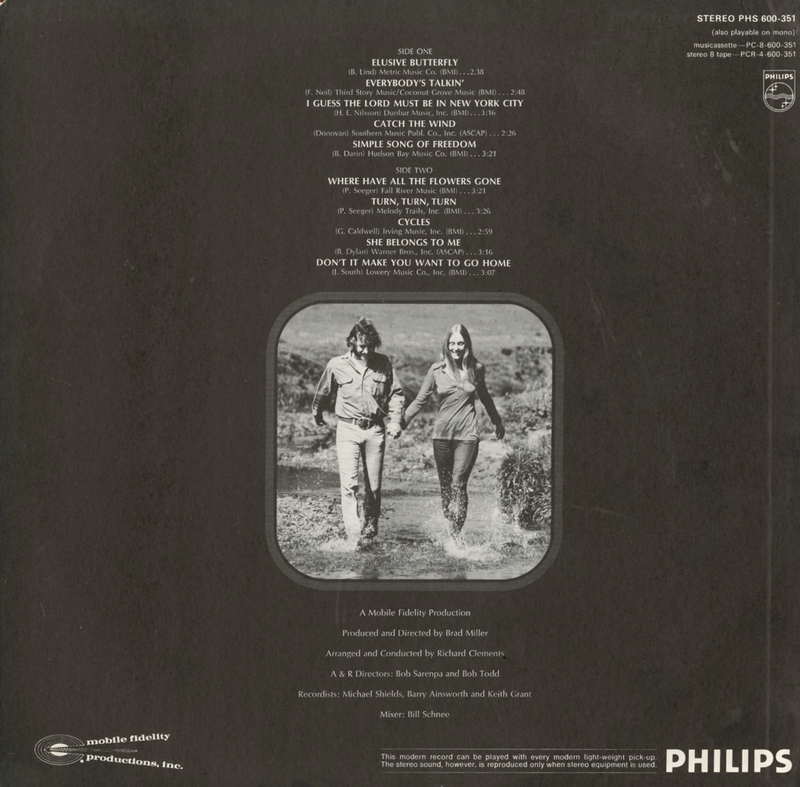 Also from the back cover: Vincent Marino, drummer, used only the standard set of percussion instruments. No sound gimmicks were used, other than added reverberation and echo chamber as commonly employed in recording studios to get a live sound. 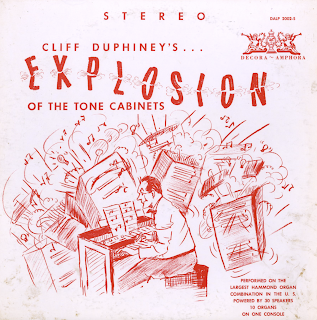 All the special effect sounds were actually produced on the console by Cliff Duphiney. A good microphone pickup was or paramount importance to get these sounds on the track – in the grooves. 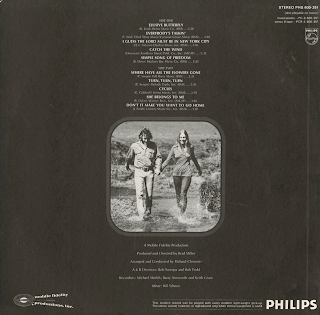 Bruce Sweden, top-flight and highly desired recording engineer was at the controls in the engineer's booth at Universal recording studio in Chicago. Bernie Clapper, Chief Consulting Engineer. 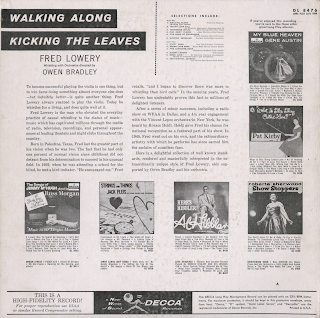 Record Publications Company - Camden, N.J.
From Billboard - September 1, 1956: Mercury has packaged some of Carroll's more danceable singles for a distinctive varied program. Jocks will continue to use these profusely. 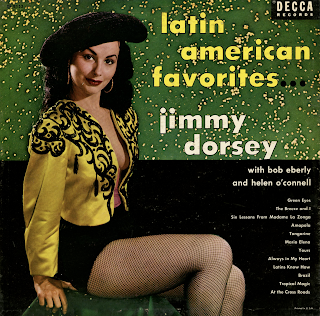 Includes: "Fancy Pants," "In A Little Spanish Town," Gadabout," and "Music Makers." 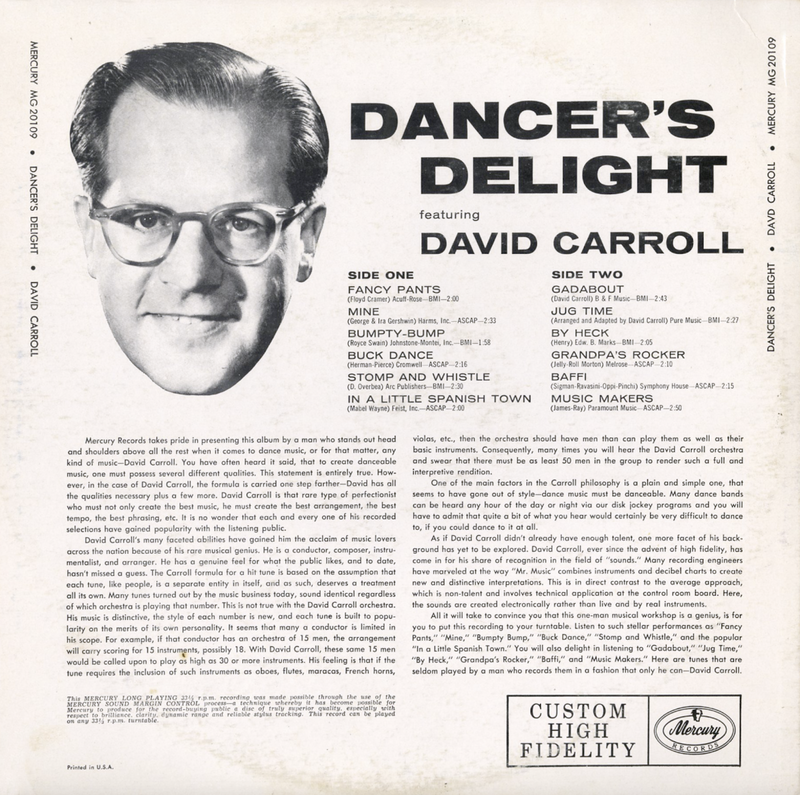 From the back cover: His (David Carroll) music is distinctive, the style of each number is new, and each tune is built to popularity on the merits of its own personality. It seems that many a conductor is limited in his scope. For example, if that conductor has an orchestra of 15 men, the arrangement will carry scoring for 15 instruments, possibly 18. With David Carroll, these same 15 men would be called upon to play as high as 30 or more instruments. His feeling is that if the tune requires the inclusion of such instruments as oboes, flutes, maracas, French horns, violas, etc., then the orchestra should have men that can play them as well as their basic instruments. 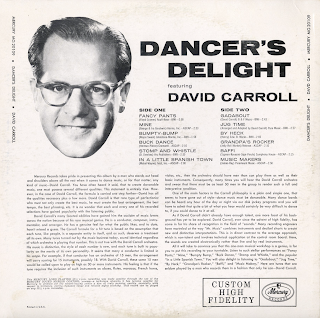 Consequently, many times you will hear the David Carroll orchestra and swear that there must be at least 50 men in the group to render such a full and interpretive rendition. Cover photo of a 1906 Renault, taken at the Montagu Motor Museum, Beaulieu. From the back cover: The idea of the "Moods Orchestral" series started in the summer of 1967, when Philips issued the first of a new series of Car Cassettes – pre-recorded taped music designed primarily for car drivers requiring well-known standards, and played in a relaxing style. The whole thing was so successful that the same music is now being issued on LP records. 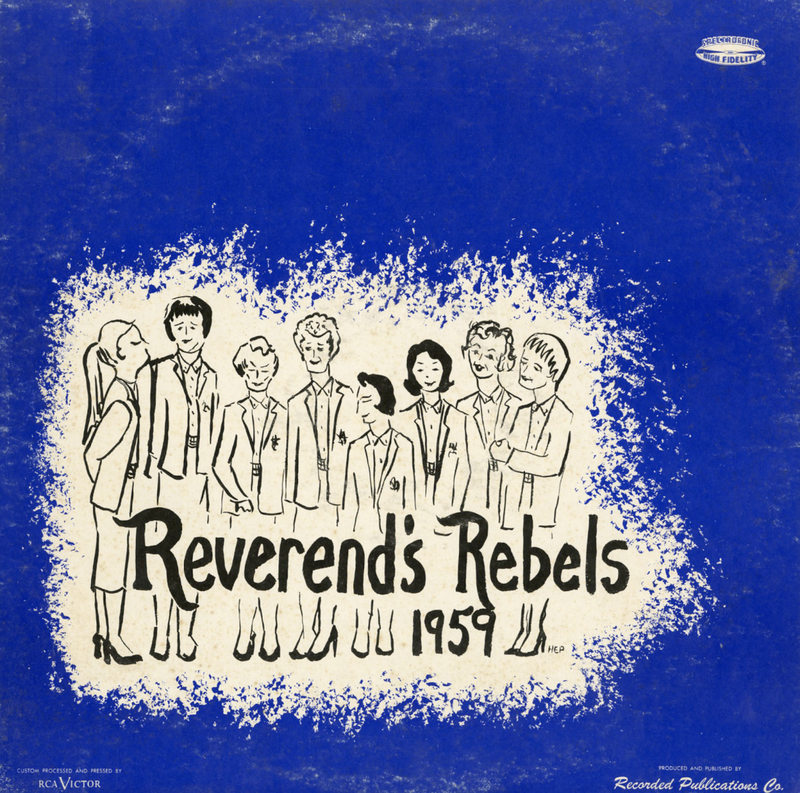 Command Records RS 826 S.D. 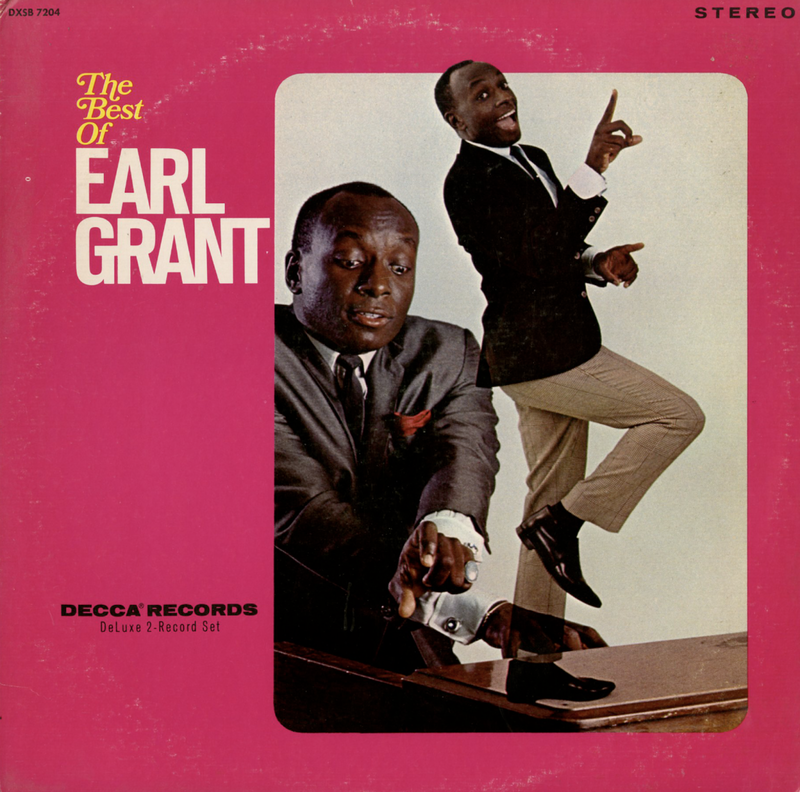 1961 Grand Awards Record Co., Inc.
From Billboard - August 8, 1961: Enoch Light has done it again with a brilliant "sound" record that should maintain Command's leadership in the field. 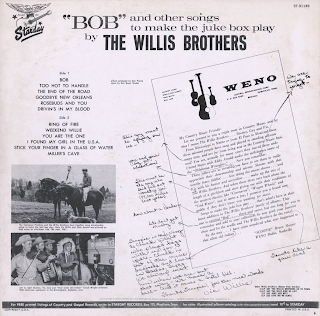 The record, recorded originally on 35-mm. film, is one of the most remarkably true sounding disks on the market, with a liveness that makes the ork sound as though it is right in the room. The arrangements by the Light crew are perfect for stereo. 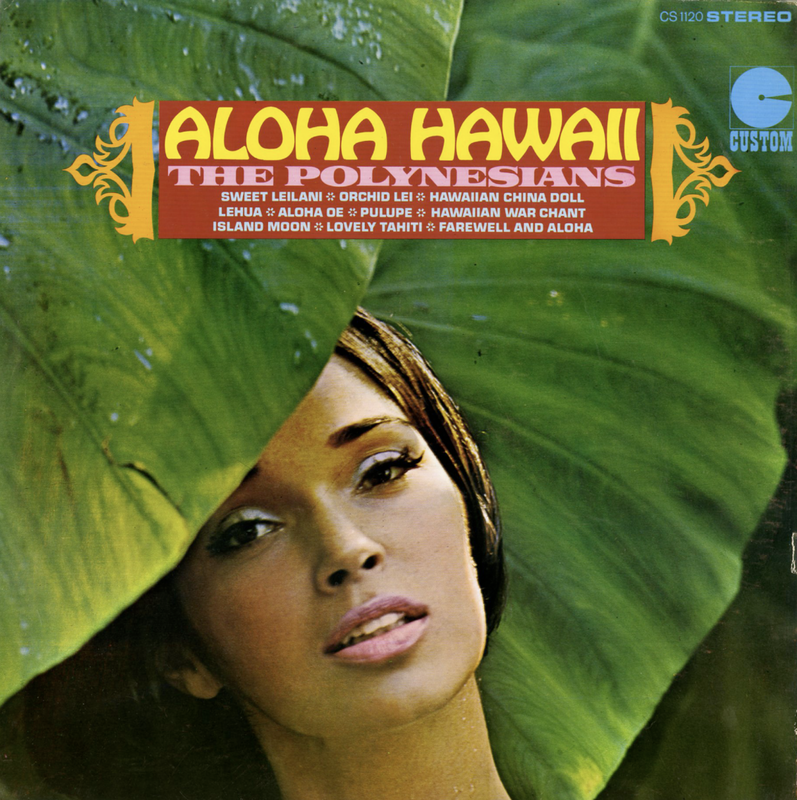 Tunes include "Heat Wave," "The Man I Love," "Love For Sale," and "All The Way." Should be a smash seller. 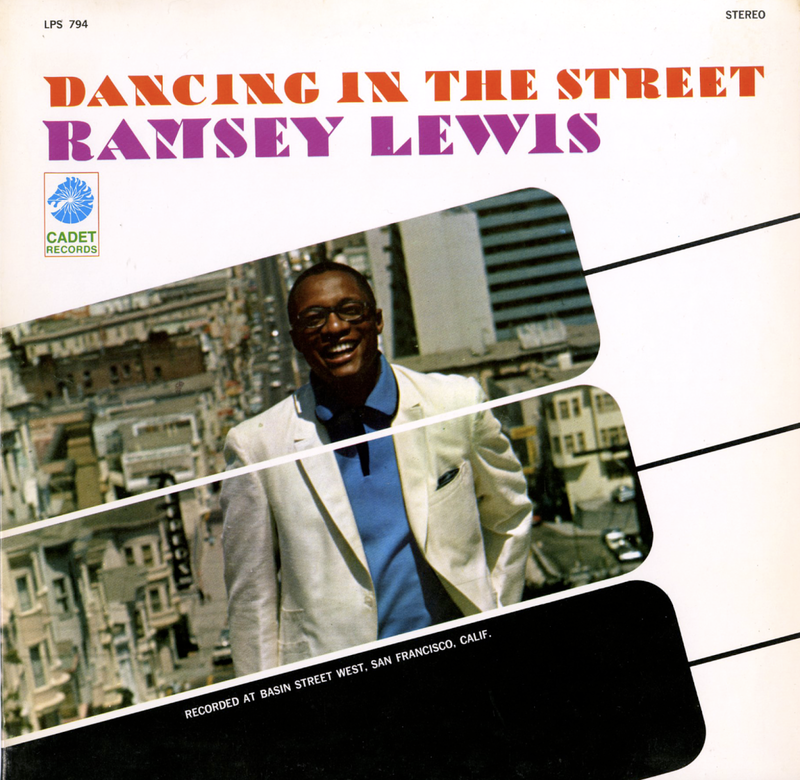 From Billboard - July 6, 1968: Ramsey Lewis' nifty translations of the pop idol into jazz have tabbed him an innovator who has drawn together the pop-jazz gap. 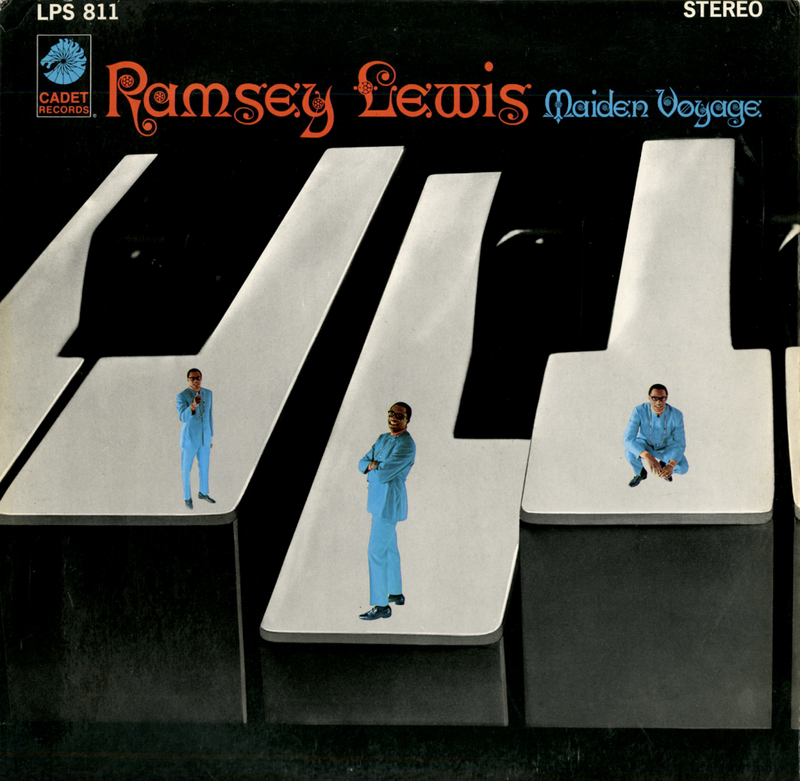 His latest LP, another unique treat to a unique jazz personality, features the title tune "Maiden Voyage" and versions of "Mighty Quinn," "Do You Know The Way To San Jose" and "Afro-Boogloo Twist" – all revived by the Ramsey Lewis beat and piano improvisation, and the best-selling Ramsey Lewis Trio. 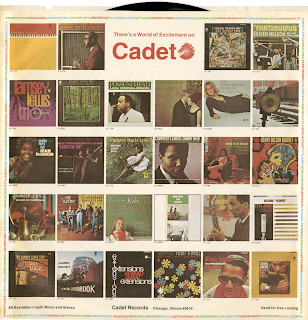 2-record set, double fold jacket. From the inside cover: Just who is this Earl Grant who comes on slick and polished that he looks like someone made him up, and who sounds like a series of guys who know exactly what to do and are doing it? He's an Oklahoman, if that's any help to you. Earl was born in Oklahoma City in 1931. His father was a Texas, Southern professor. 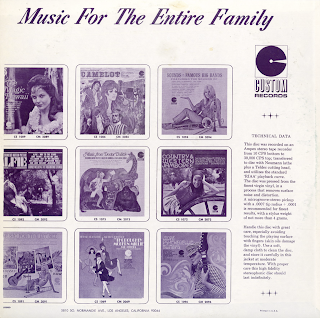 When Earl was still a child, the family moved to Kansas City where there has always been a tradition of fine music. And that's also where Earl started studying music, a loving chore that has occupied most of his life. Among the instruments he knows are, of course, organ and piano, but he also plays trumpet and drums. From this wide variety of tonality in his musical background, Earl can draw the unique sounds and approaches that make his music so distinctive. 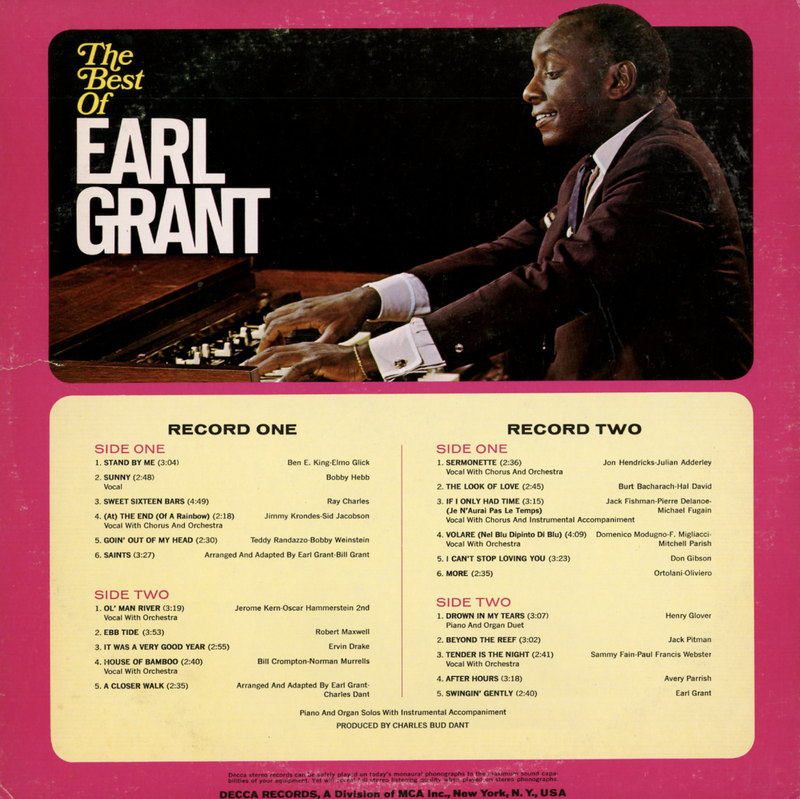 If he's at the organ keyboard, and the trumpeter in him feels the need to dig into a chorus, why shouldn't Earl laugh into just such a trumpet-like attack on the organ? He attended the University of Southern California and majored in music. 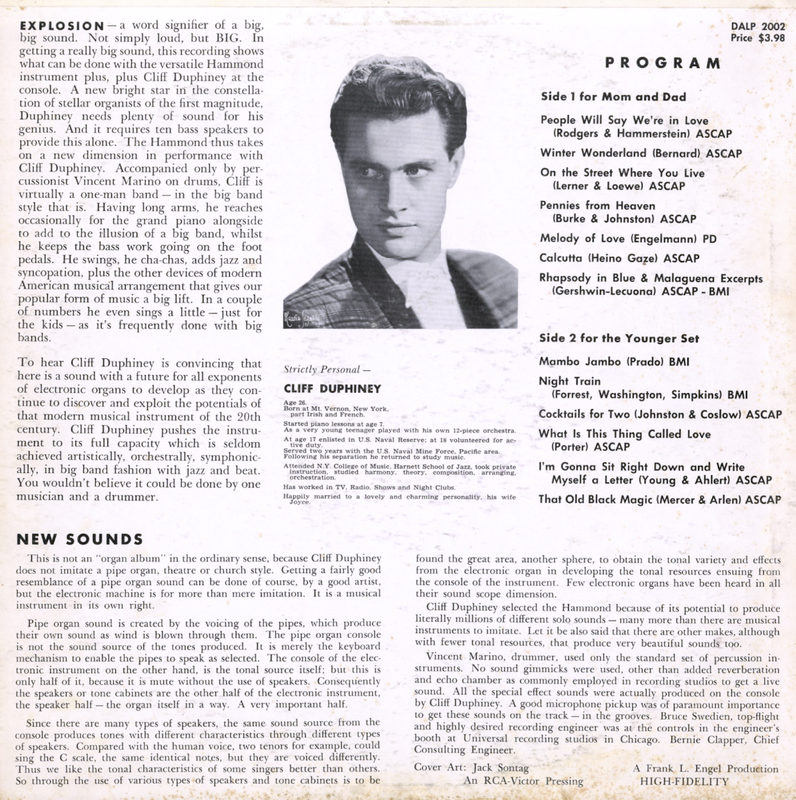 After graduation, he did post-grad work in music at the New Rochelle Conservatory, Chicago's De Paul Conservatory, and the Kansas City Conservatory of Music. His course was set. Earl had decided to teach music as a career. But, after a hitch in the Army, he came back and picked up his post-graduate studies at the University of Southern California. 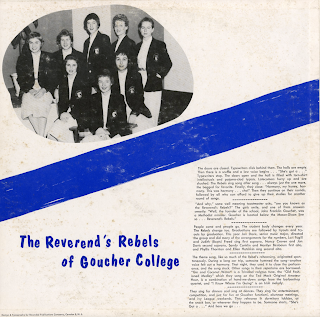 To help defray the expenses of campus life, he began singing in small clubs in the Los Angeles area. 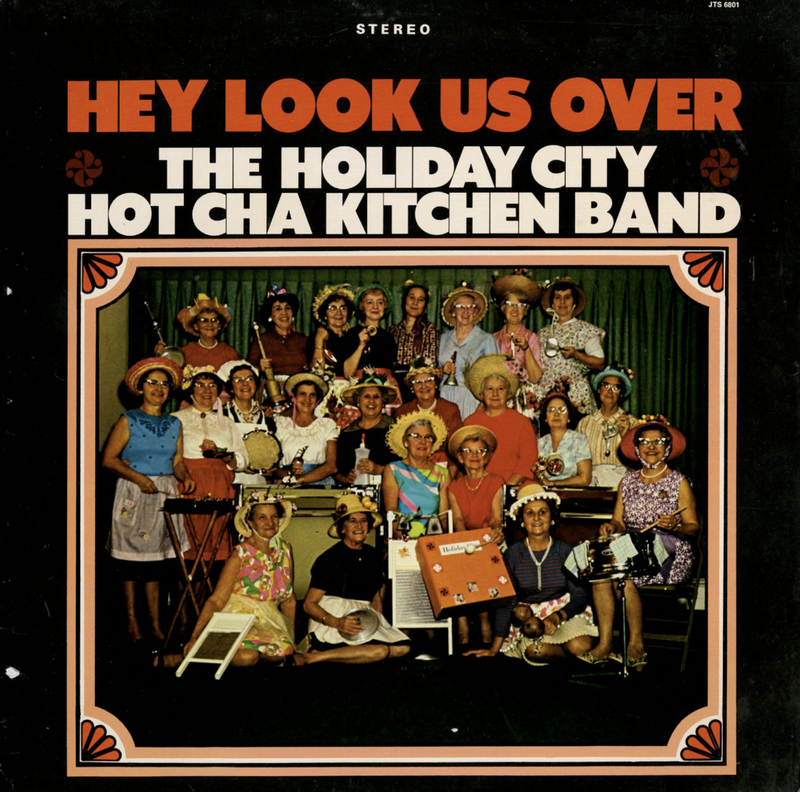 Before long, he was so popular that he had to set aside his budding career as a music teacher and become the performer. His first big break came when he played at the Pigalle Club in Los Angeles, and his first national breakthrough came when he landed his Decca recording contract and really began to groove. Available from online vendors so I will not be posting a sample. 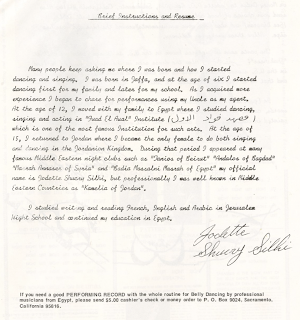 Presented here to share the back cover biographical information. 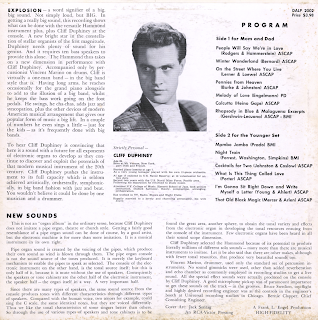 From the back cover: The interpretation he brings to a song undoubtedly is due to the fact that he has been singing since he was a child, and to the further fact that his songs were church music. In his native Leesburg, Georgia, he became a member of the choir at the age of six. 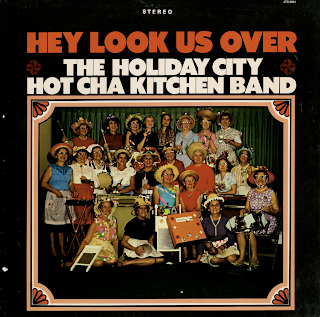 This continued after his family moved to Jersey City, New Jersey when he was fourteen, and in this locale he was often heard as soloist in ceremonies at the Central Baptist Church. Music had not been his only love, however. Commercial art held much attraction for him and so great was his success in this that some samples of his work have been put on display in local galleries. Amateur boxing rounded out his extracurricular training and, again, he met success, avenging his only defeat in six matches when he met the same opponent in a rematch. 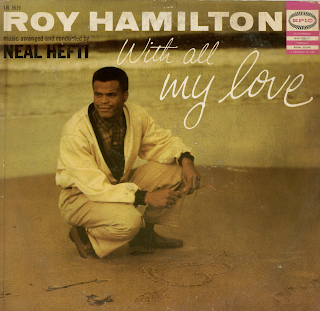 By now it is apparent that whatever Roy Hamilton puts his hand to he does sincerely and with the kind of energy that make success almost a foregone conclusion. Seen in this light, his amazing rise to fame a popular singer is only the inevitable result of his bringing to it the qualities developed in him during thesis early years. He first left the field of scared music only to extend his repertoire, choosing good songs from light operate and musical comedy. 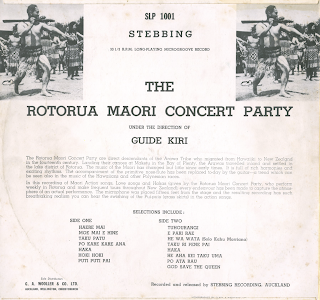 When he began to be heard he was offered an occasional engagement as a popular singer in night clubs. It was on such and occasion that he was heard by disk jockey Bill Cook, who in turn got him a recording audition. He was signed at once and the rest is history. For some years now Neal Hefti has been in the forefront of arrangers, composers and conductors, and has supplied some of the most delightful and interesting orchestrations and original around. Born in Hastings, Nebraska, his first musical instrument was the trumpet. Charlie Barnet gave him his first big-time break and he also played with Charlie Spivak's orchestra. In 1944, he joined the Herman Herd, and began the string of classic arrangements that made him famous. 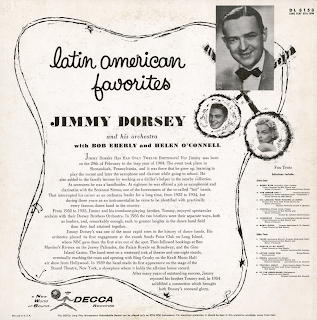 He has contributed a number of superior orchestrations to the Harry James group, among others, and was responsible for such great Woody Herman arrangements as Caldoina, Apple Honey and Northwest Passage. Backing Roy Hamilton, Neal Hefti uses the colors of today's livelier ideas combined with the firm, swinging tempos of the ballad. From Billboard - March 9, 1959: This (Epic BN 518) is the stereo version of the Roy Hamilton album that was released about a year ago. 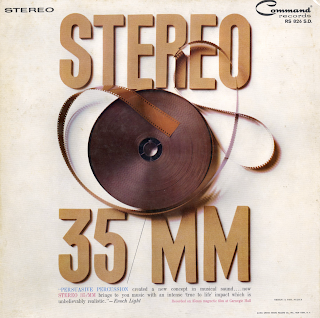 Stereo separation is good and fans of the singer who do not have the monaural set will be interested in this stereo waxing. 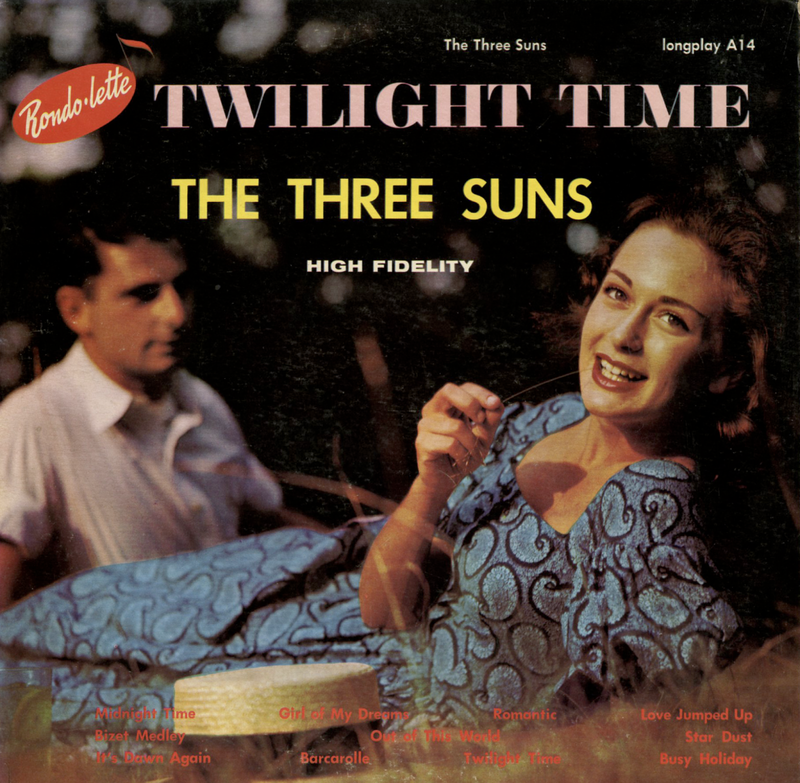 Tunes are all standards, including "Always," "Time After Time" and "Speak Low." Cleveland J. Eaton was born in Fairfield, Alabama, in 1939. In the midst of a throughly musical family, he began to studying music when he was 5 years of age. He was literally inundated with four piano teachers in the Eaton household – his mother, two sisters, and an aunt. 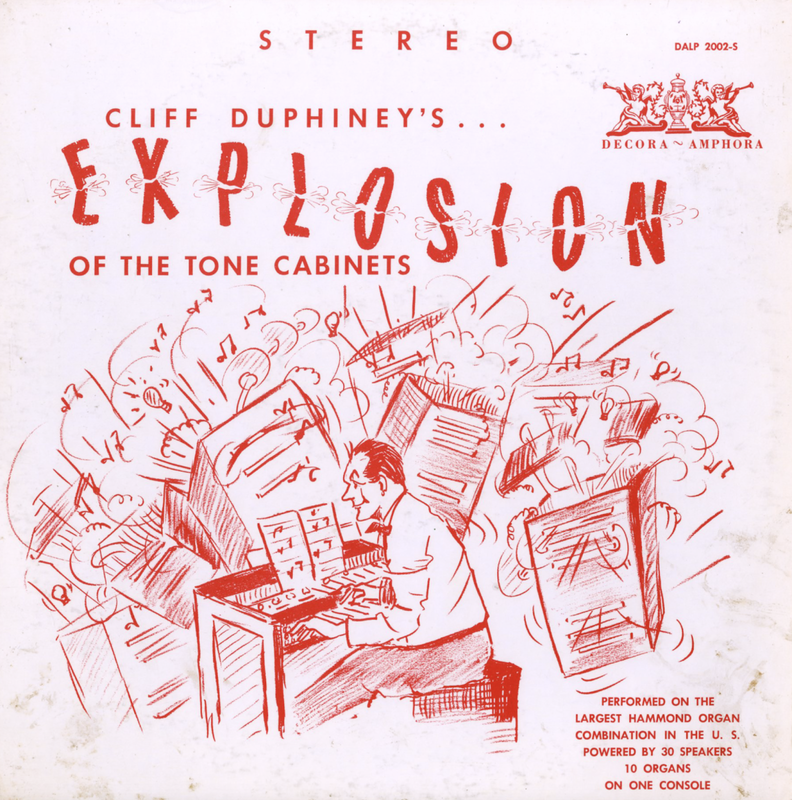 Four pianos and a Hammond organ were available so it was inescapable that he became a keyboard student. His two Juilliard-trained sisters have since become concert pianists. 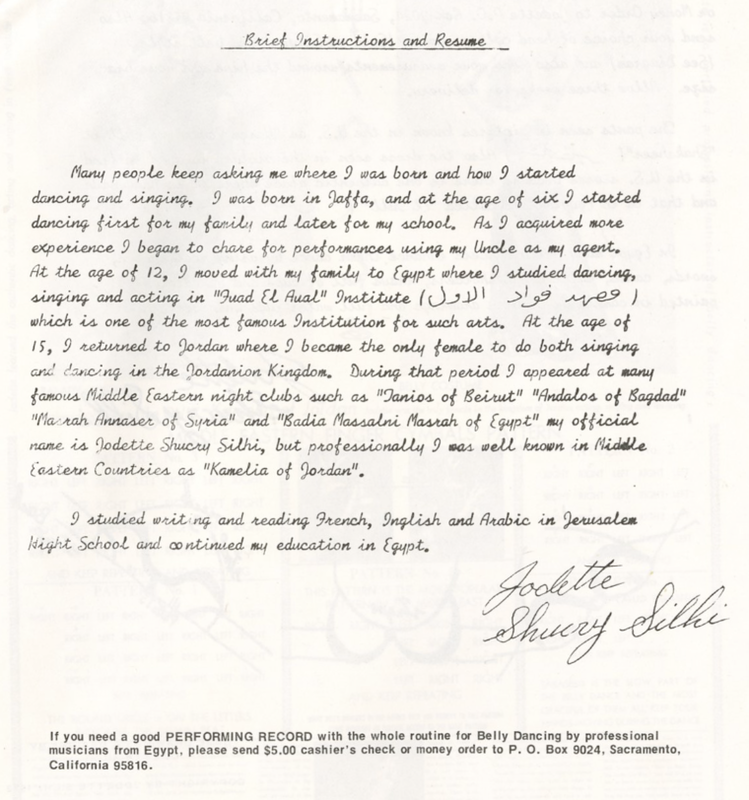 Cleve shifted to the alto saxophone at 10; although he was in elementary school, he played alto for two years as a member of the Fairfield Industrial High School. Following a short try with the trumpet , Cleve proceeded to involve himself in a literally long parade of instruments – the tuba and the string bass being the last two he learned in the 11th grade. After only two weeks with the bass, he started a gig with the Leon Lucky Davis in Birmingham, Alabama. 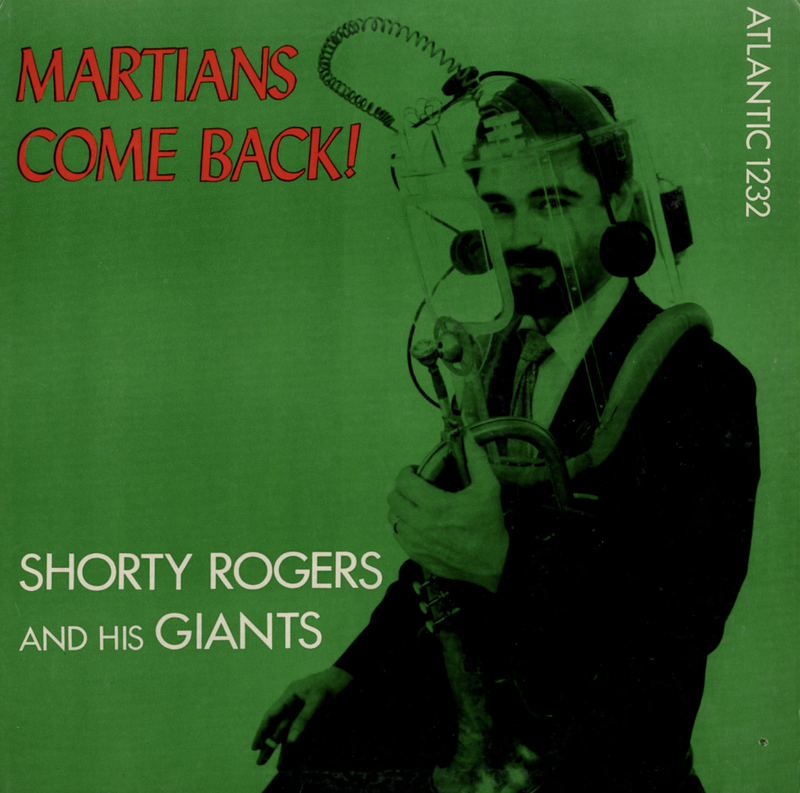 In search for a music scholarship, he was ultimately awarded one for tuba at Tennessee State. He majored four years on tuba and minored in string bass; he also earned a Teaching Credential along with his diploma. A couple of days after his graduation, he arrived in Chicago and in no time he was playing in a Monday night session at the Sutherland. The late Nat "King" Cole's brother, Ike, heard Cleve and invited him to join his group; subsequently he traveled with pianist Ike Cole for 1 1/2 years. In New York City, the quintet of trumpeter Donald Byrd and baritonist Pepper Adams became his next jazz anchorage. 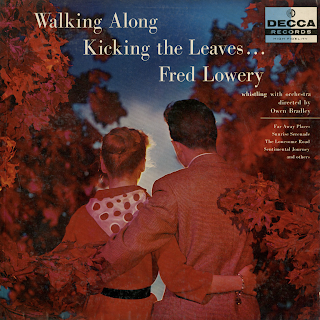 Three months later Chicago drew him back, and in late 1961 Cleve joined pianist Larry Novak' trio which played part of nearly every week for 5 years at the London House. Energetic Mr. Eaton played the tuba, the fender bass and string bass on studio assignments – recording, radio and TV commercials, etc. 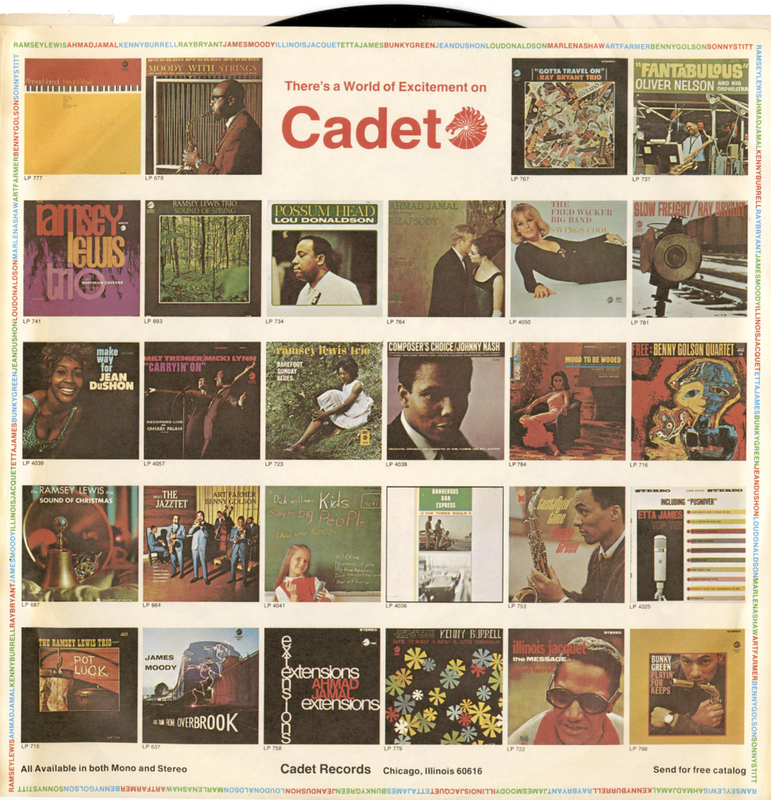 Concurrently he taught fifth and sixth grades in the Chicago Public Schools, winding up with seventh and eight grade instrumental music in the last two years of employment. 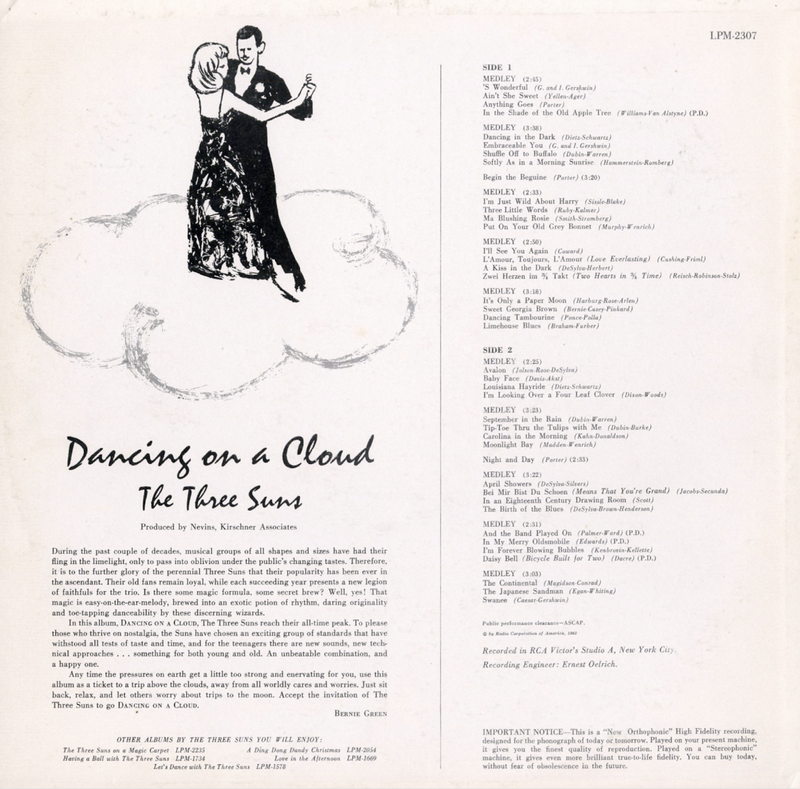 Cleve played bass for nearly every major act that came through Chicago – Joe Williams, Nancy Wilson, Gloria Lynne, Jack Jones, et al; he was also present on a great many jazz recording sessions. 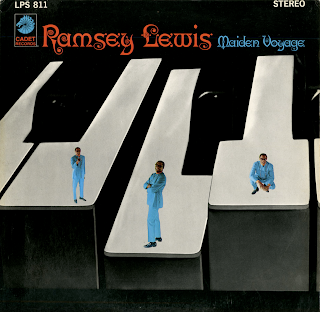 In June of 1966, Ramsey Lewis recruited Cleve for his trio. The two had met originally while they were playing opposite each other in the London House. 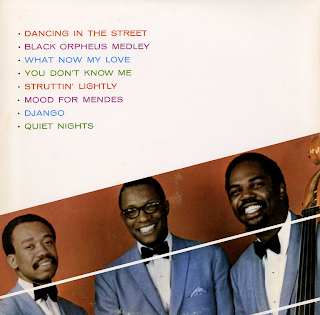 The lithesome drummer in Ramsey Lewis' Trio was born in Memphis, Tennessee, in 1942. He is the son of Verdine White, M.D. in Chicago. From the age of 6 to 12, he sang in a gospel quartet and traveled extensively in the South East. At 13, he started playing the drums, gaining early experience with a marching band and a combo that played in a sanctified church. 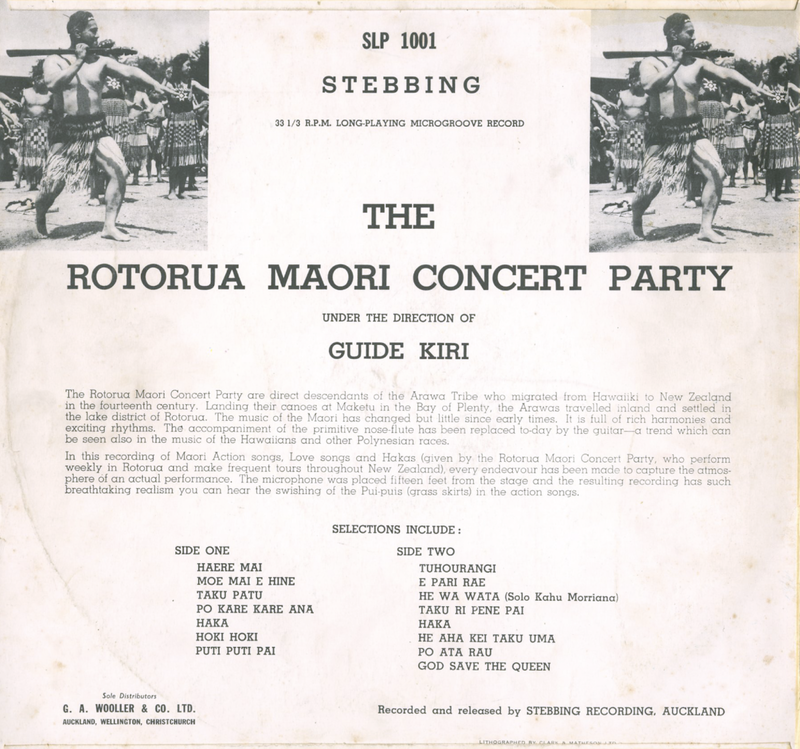 Continuing his studies of the drums following his emigration from Tennessee in 1961, Maurice settled in Chicago and engaged the tutelage of a series of four instructors. His academic training included two years at Chicago Music Conservatory. Prior to his union with Ramsey Lewis in June of 1966, Maurice spent three years as staff drummer win the Chicago studios playing a wide range of music and assuming a variety of roles as a percussionist. And, like bassist Cleveland Eaton, he participated in numerous recording sessions in the Windy City; these assignments brought him into close contact with many musicians including Ramsey. Drummer Art Blakey was the first jazz drummer to pry open Maurice's ears and provided the motivating force to spur him on to play jazz. This period of jazz exposure lies in the latter part of 1960 and early 1961. Prompted to investigate more deeply, Maurice discovered the masterful of Roy Haynes who is cited as the drummer whose influence has given Maurice the most direct and enduring effect. In sincere admiration, Maurice commented, "People are just finding out that what they are doing, Roy was doing decades ago. Of course, I dig other drummers, too – Philly Jo Jones, Max Roach, Tony Williams, Alan Dawson, and Elvin Jones. Incidentally, Elvin is a stylistic descendent of Roy Haynes' mold too. 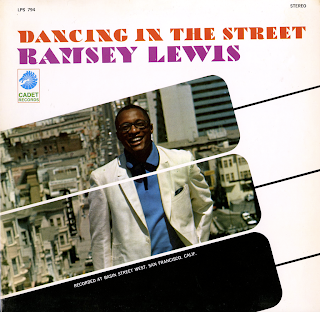 From Billboard - October 14, 1967: Ramsey Lewis is an expert at revitalizing pop tunes with a personalized pop treatment that knocks on the doors of both the pop and the jazz fields. 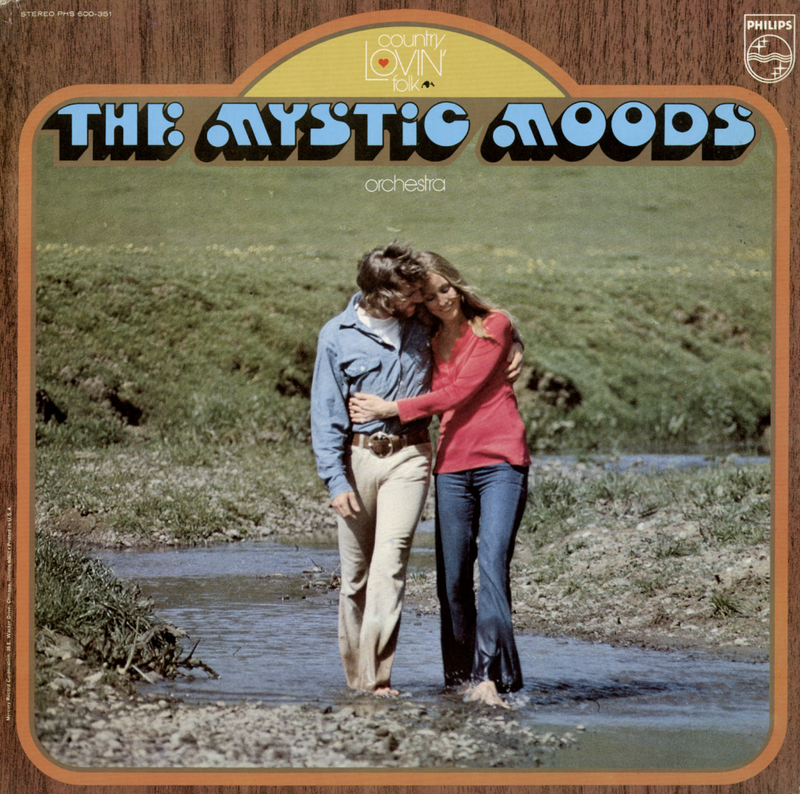 This is the debut LP of his new group and it's right in the hit groove with "Dancing In The Street," "What Now My Love," "You Don't Know Me." It's Fun - Best Way To Reduce Weight - Completel Exercise For Your Body And Mind! 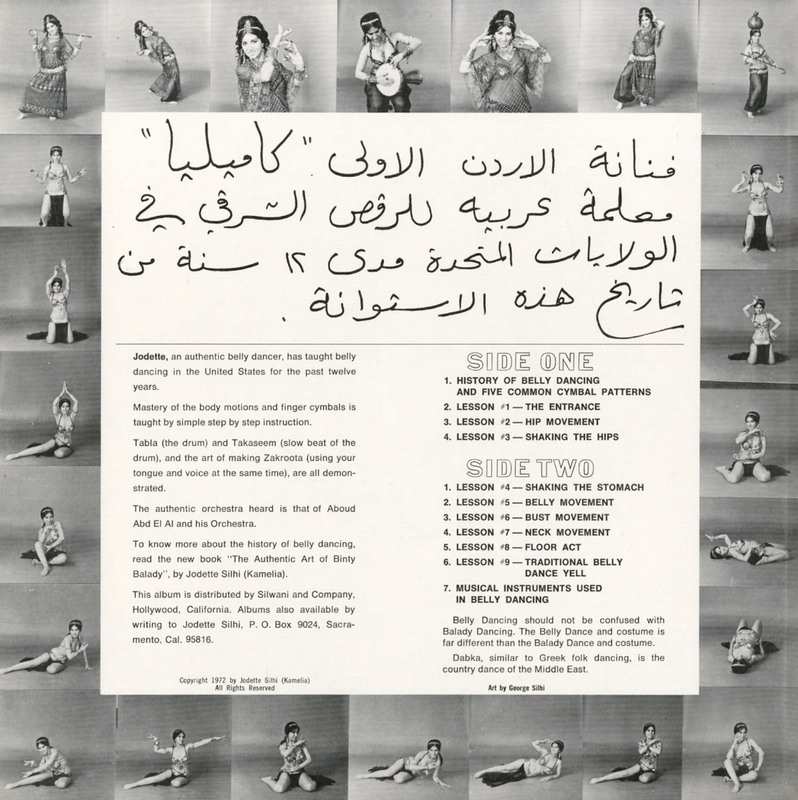 From the back cover: Ahmed Shiba and his group hail from Iraq. His father was a lute player who taught him to play this instrument at the age of five. 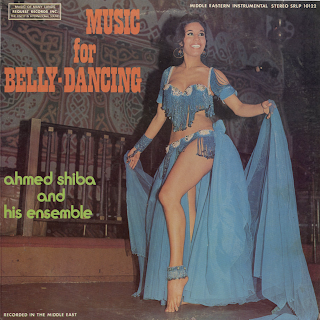 Now, Ahmed Shiba and his musicians have traveled the Mideast and through the exclusive nightclubs of Europe, specializing in the accompaniment of Belly Dancers. 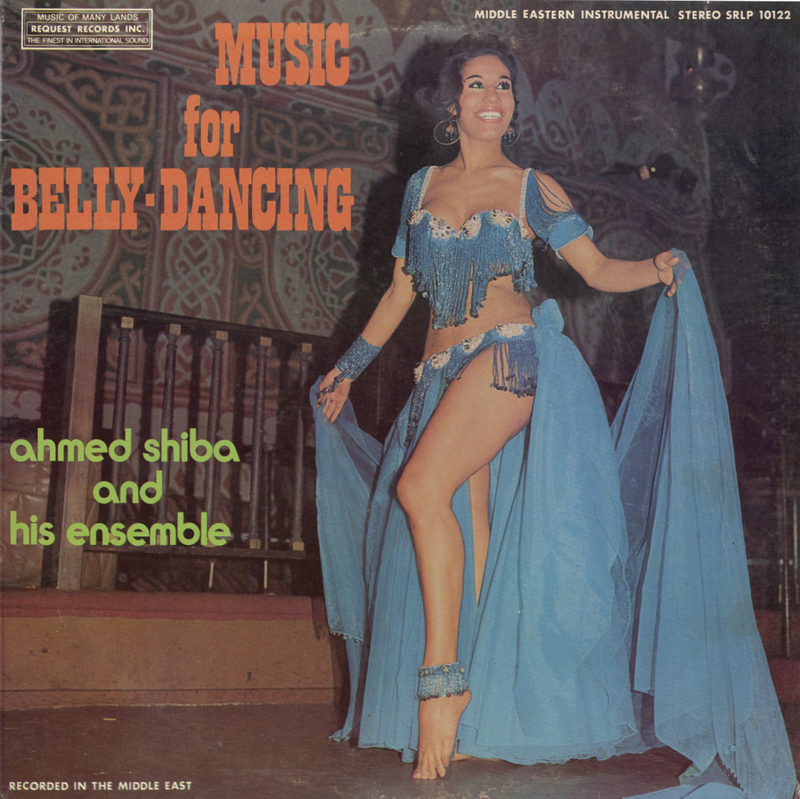 There is hardly a star in this field, who, at one time or another, has not sought the art of Ahmed Shiba. 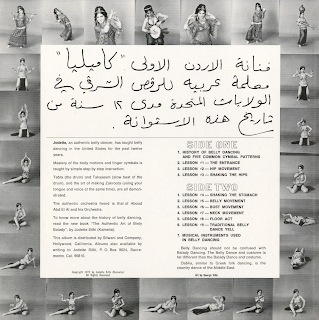 From the back cover: Born in Palestine, Texax, Fred lost the greater part of his vision when he was two. The fact that he had only one percent of normal vision since childhood did not detract from his determination to succeed in his unusual field. 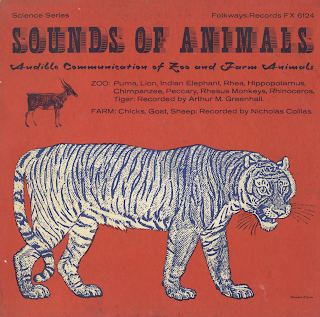 In 1929, when he was attending a school for the blind, he met a bird imitator. 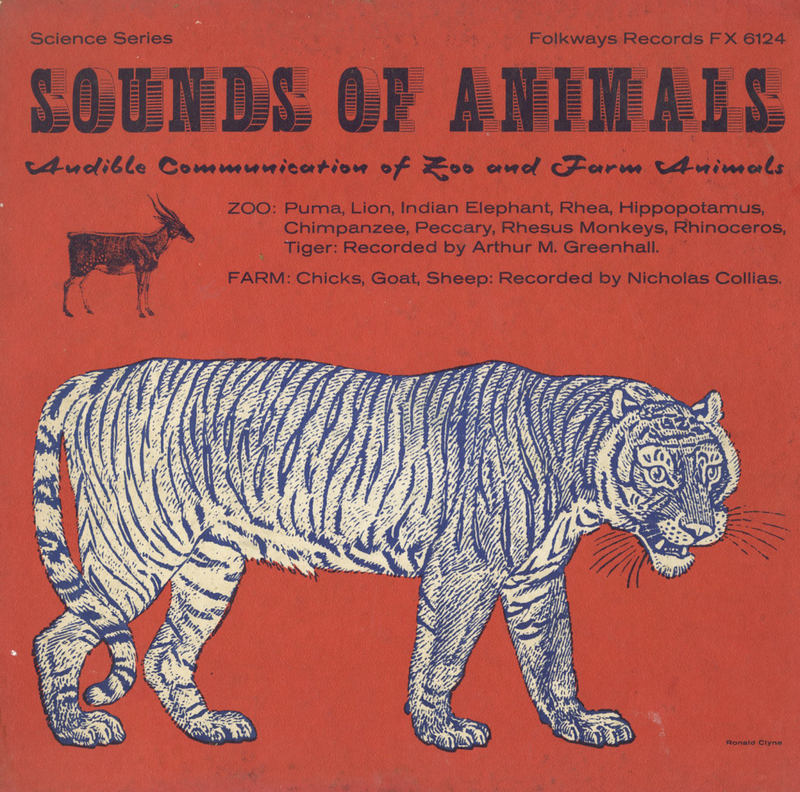 "He encourage me," Fred recalls, "and I began to discover there was more to whistling than bird calls." In the ensuing years, Fred Lowery has undeniably proven this fact to millions of delighted listeners. After a series of minor successes, including a radio show on WFAA in Dallas, and a 4 1/2 year engagement with the Vincent Lopez orchestra in New York, he was heard by Horace Heidt. Heidt gave Fred his chance for national recognition as a featured part of his show. In 1945, Fred went out on his own, and the extraordinary artistry with which he performs has earned him the acclaim of countless fans. From Billboard - March 20, 1957: Veteran blind whistler Lowery in nostalgic standards ("Sleepy Lagoon," " Far Away Places," etc.) in usual tasteful, trilling fashion, with an able assist from Owen Bradley's ork. A sentimental change of pace for jocks with adult audiences. Package has solid sales future in limited market for whistling wax. 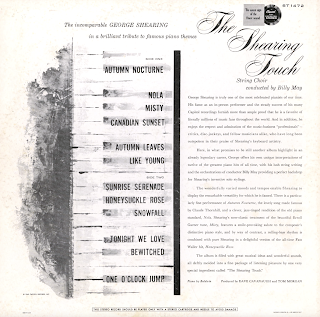 From the back cover: The phrase (Towering Feeling) comes from Alan Jay Lerner's Lyric for On The Street Where You Live, the charming song from "My Fair Lady" which Vic sang into first place among the ballads of 1956. 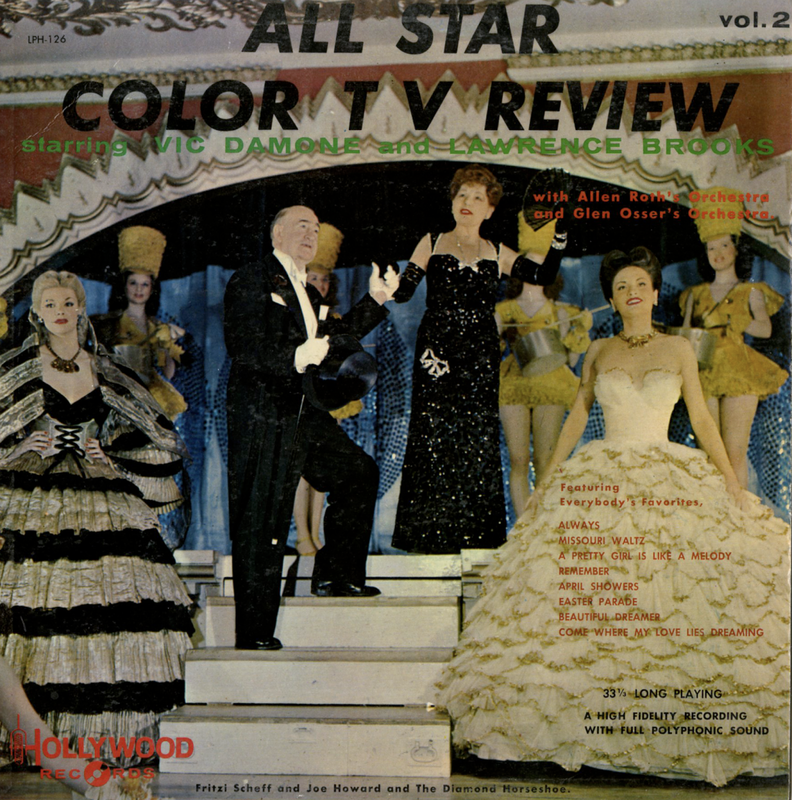 This record, along with his television program and his motion picture appearances, left no doubt that Vic had resumed his position as one of America's top singing stars. He temporarily abdicated that position for two years in the Army, serving in both the United States and Europe. This interlude came when Vic had just reached the top, rounding off a climb that began in Brooklyn in 1928. Vic's father arrived here from Italy shortly after the World War with a ringing voice and a plentiful supply of melodious folk songs that kept the family entertained for many an evening, with Vic's mother at the piano. During his schooling, young vic took part in amateur dramatic presentations and the work of the school glee club, along with his studies, and made his first radio appearance at the age of fifteen, singing on the "Rainbow House" show over Station WOR. Soon thereafter he got a part-time job as an usher at the Paramount Theatre, where he was able to watch a seemingly endless string of the finest singers of the day and absorb invaluable lessons. 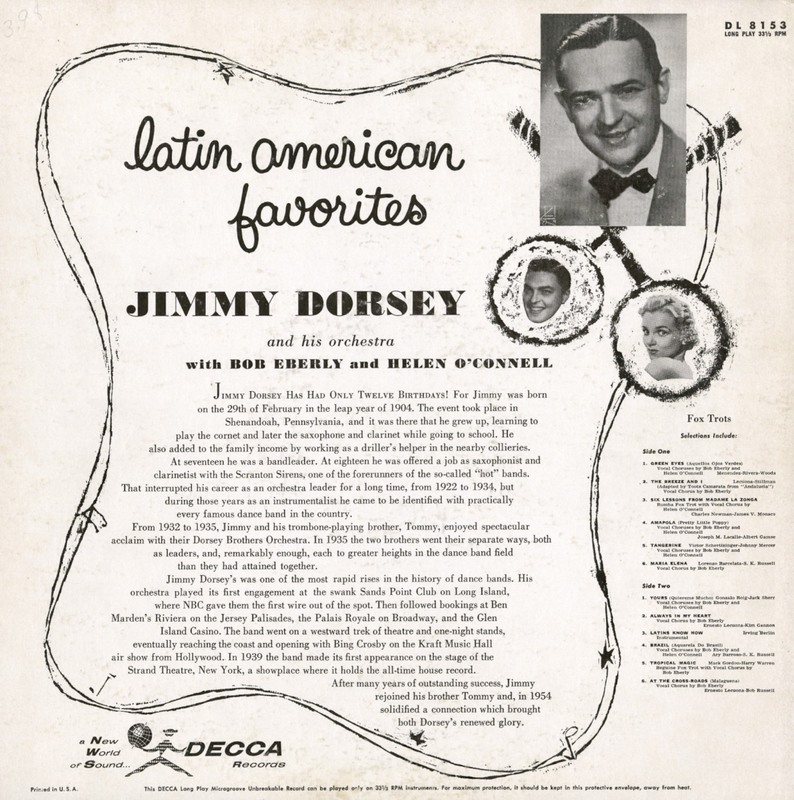 Later, while he was working as an elevator operator, he seized an opportunity to give an impromptu audition for Perry Como, a captive audience, who advised Vic to make singing his career. During the war years, young Vic made appearances at church socials and canteens, polishing his style, and finally auditioned for the Arthur Godfrey Talent Scouts program. Milton Berle heard him there, and promised that if Vic won the contest, he would help him get his career under way. Vic Came out on top, and was soon set for an audition at La Lartinique, which was famous as a club where many young singers had had their first taste of fame. 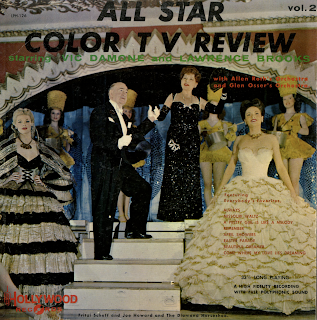 Vic remained there for eleven weeks and was showered with offers for other engagements, among them his own radio show and the chance to return to the Paramount as a star attraction. 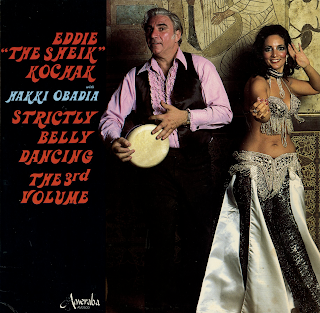 In 1947, he signed for his first commercial radio show, which ran for two years, and thereafter appeared at all the major hotels and nightclubs in the country. His movie debut came in 1950, in "Rich, Young and Pretty," and then the Army intervened. Since his return to civilian life, Vic has picked up where he left off in no uncertain terms, and even better, has married the enchanting Pier Angeli. And who, quoting from another lyric, could ask for anything more? 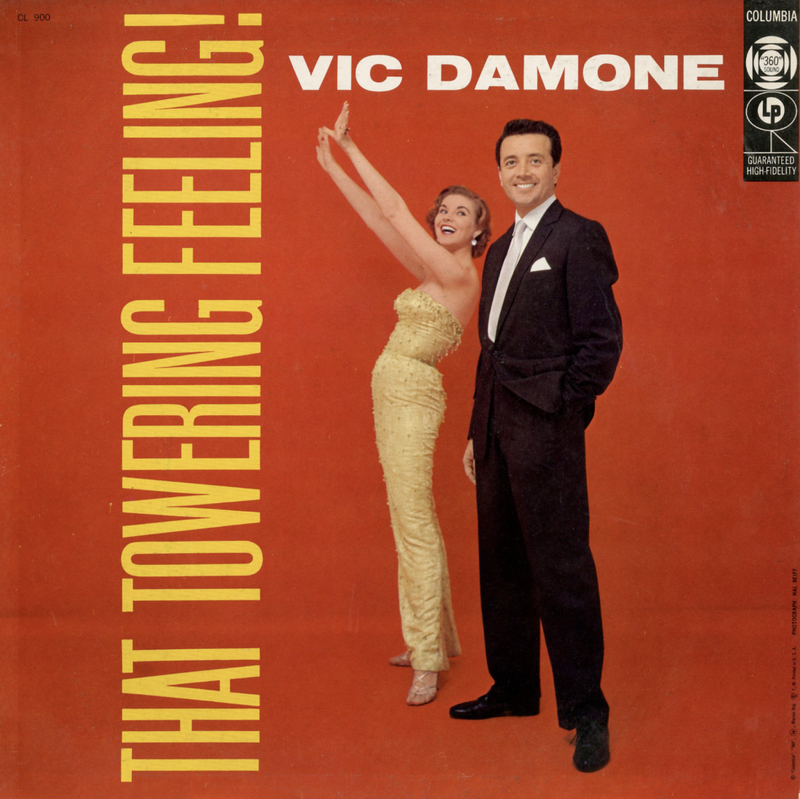 To illustrate the towering feeling, Vic has chosen twelve notable expressions of romance, mostly from the thirties and forties, including contributions by such expert hands as Richard Rodgers, Jerome Kern, Irving Berlin and Vincent Youmans, among others. 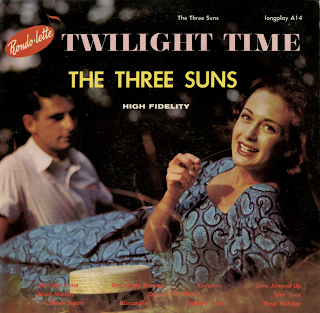 Some of them are presented in standard ballad tempo, others have a more light-hearted approach deriving from the occasional giddiness that romance engenders. 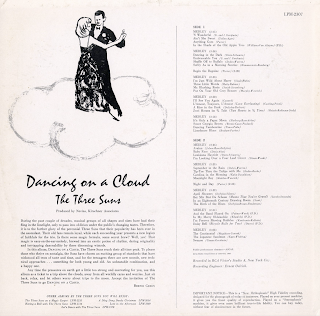 Contrast is provided in the accomplishments, too; four tunes are heard with a small combo plus five strings, with Buck Clayton warming passing choruses with his trumpet. 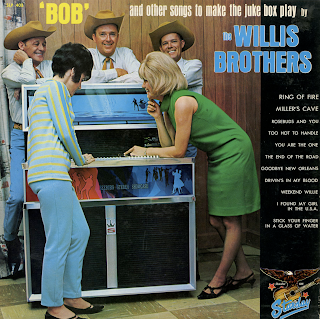 Others are heard with full orchestra and vocal chorus, still other with a rhythm section and Urbie Green's trombone. All of them, of course, are blessed with the matchless velvety quality of splendid entertainment, and in all of them Vic conjures up the winning picture of a young man in love, spreading the contagion of the towering feeling around for everyone to share. 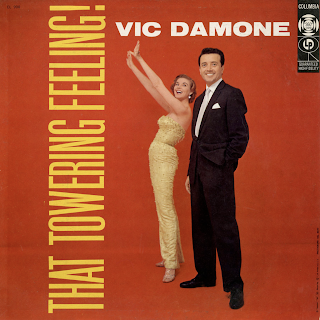 From Billboard - September 15, 1956: The lyric of Damone's hit single, "On The Street Where You Live," inspired the title of this LP, which features the warbler in fine vocal form on 12 nostalgic love songs, mostly from the 1930s and 1940s. Damone sings as usual – with impeccable taste and richness – while Camarata provides three different types of backing. Damone is hotter (as a single artist) than he has been in a long time, which should help sales on this package. 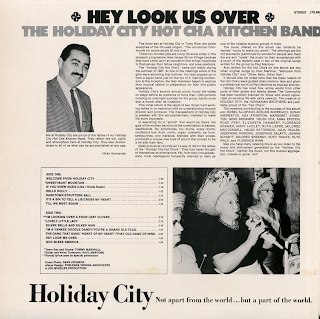 From the back cover: We would like to thank Samiha Koura, owner of Ibis, 151 East 50th St. N.Y.C. for her courtesy in allowing us to photograph at her beautiful club which features an international floor show and authentic oriental dancers. 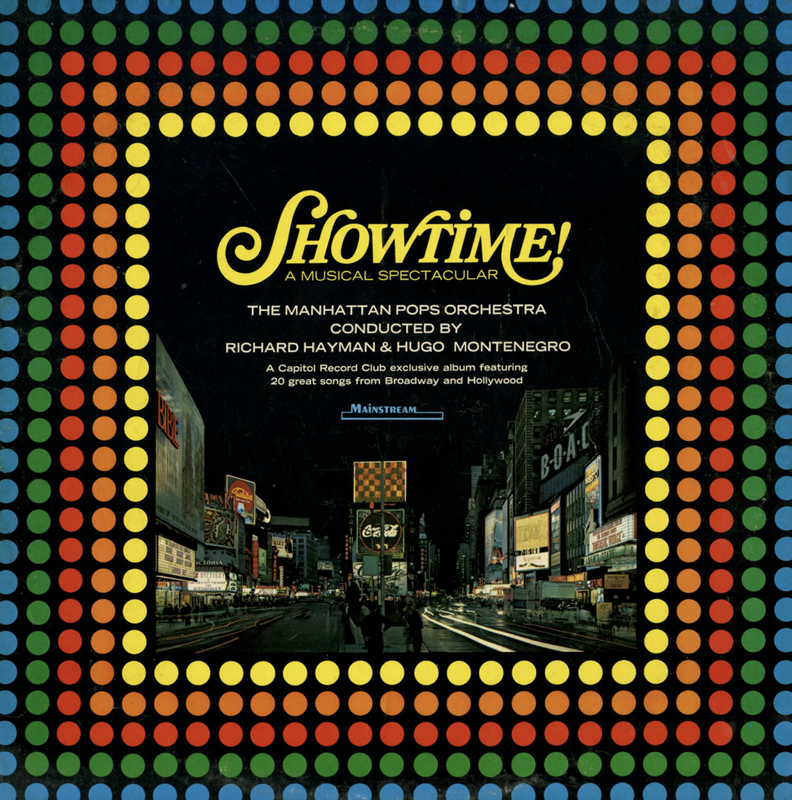 From Billboard - May 5, 1971: The orchestra continues its successful formula of using sound effects to implement orchestration this time out performing contemporary folk material. 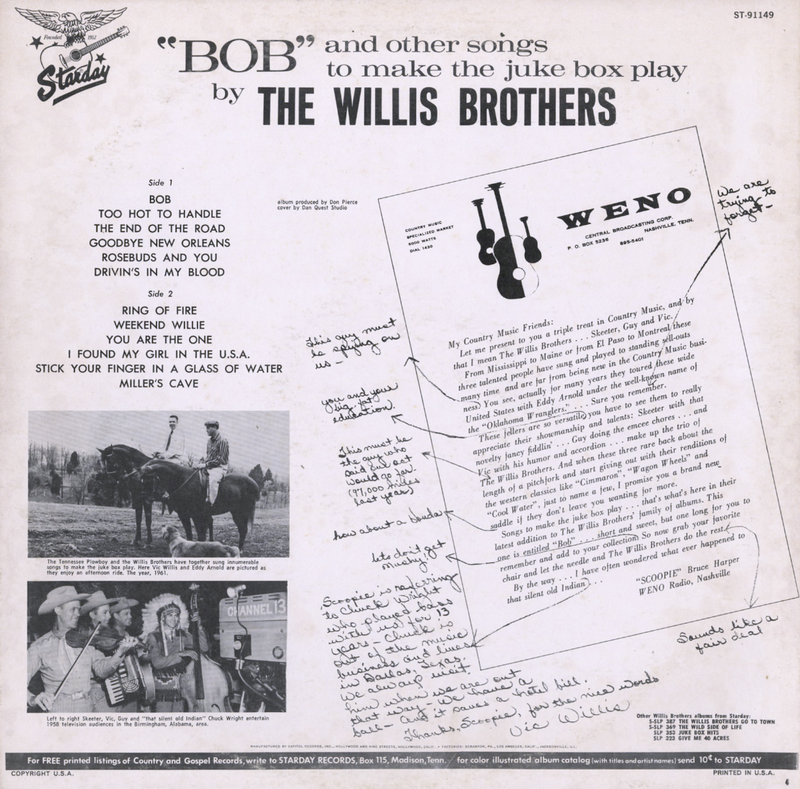 Crickets, horse's hooves, trains, and other sounds are integral parts of the arrangements for "Everybody's Talking'," "Simple Song Of Freedom," and "Don't It Make You Want To Go Home." Designed by Liebert Studios, Inc. Mainstream Records / Manufactured by Capitol Records, Inc. I'll Be Seeing You from "Right This Way"
The Sweetest Sounds from "No Strings"
The Cardinal - Theme from "The Cardinal"
The Third Man Theme from "The Third Man"
Try To Remember from "The Fantastiks"
The Rain In Spain from "My Fair Lady"
It Might As Well Be Spring from "Stare Fair"
The Surrey With The Fringe On Top from "Oklahoma!" How To Handle A Woman from "Camelot"
I Concentrate On You from "Broadway Melody"
Easy To Love from "Born To Dance"
The Way You Look Tonight from "Swing Time"
If Ever I Would Leave You from "Camelot"
I've Got You Under My Skin from "Born To Dance"
Explanation of their success is difficult. It has been said that they play the kind of music people want to hear at a time when people want to hear it. In other words they posses a sixth sense as to what will be popular and play just that. 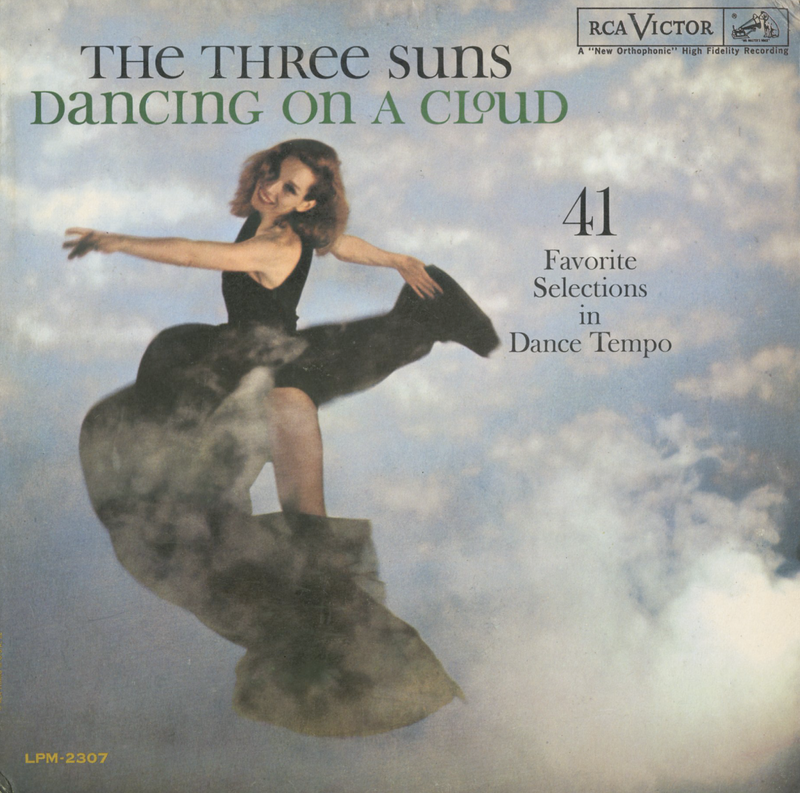 Since the tremendous smash hits the trio scored, many similar combinations have come into being, but have offered virtually no competition to the already established Three Suns. The group got its name when the mother of Al and Mort greeted the inseparable three one by saying "Here comes my three son." The boys felt the title was excellent for their professional name with the change of one letter in the name of sons, the group was born.